CD review: "Rainin' in California"
This import from Austria's Wolf Records features a 1983 live set in Long Beach, Calif. It's an interesting band playing behind King: drums, organ, piano and trumpet. Not your everyday blues combo. As with most Wolf releases, this is a dearth of information. Where in Long Beach was this recorded? Who knows, it's not in the liner booklet. There is also a questionable cut included. While there are nine songs on the CD, coming in at right about 45 minutes total, the first song is only the band  no Albert King. And that's more than 7 minutes long, or about one-sixth of the total CD. 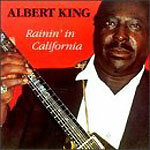 It's a good band and a nice performance, but you're paying to hear Albert King, not a backing band. But the recording quality is outstanding, especially for a "live" set. If you want to check out King in that setting, you'll enjoy this album. His guitar playing and singing are in top form, he's backed by a solid band, and there's a good selection of material not usually associated with King  covers of "The Sky is Crying," "I'll Play the Blues for You" and "Kansas City," among others.